A novelty to some and occult device to others, the Ouija board’s popularity has waxed and waned over the years. 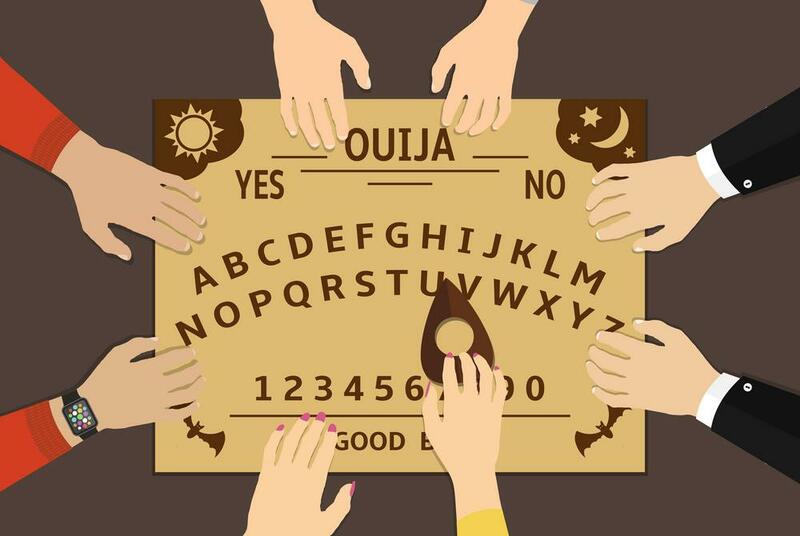 The origins of the Ouija board can be traced to France and the interest in spiritualism that was sweeping both Europe and the United States during the mid 1800s. In France, a small, heart-shaped disk called a planchette was used to write out messages from “spirits.” The planchette sat on three short pegs and had a pencil attached to its center. While two people placed their hands lightly on it the planchette would move around a piece of paper and write out words in answer to questions. C. W. Kennard and C. Reichie both claimed to have created a version of the French spirit board in America. Kennard modified the design of the planchette into a disk with a pointer in the center that would move around a board on which was written an alphabet. Messages would be spelled out as the disk paused at different letters. Kennard marketed the board through his company, Kennard Novelty. William Fuld, a foreman who worked for Kennard, along with his brother Isacc, bought the rights to the board and established a patent on the novelty in 1892. The brothers formed the Southern Novelty Company and began marketing their device as the Oriole Talking Board. Sales of Ouija boards quickly took off and the Fluds earned $1 million in sales by 1899. They soon opened a factory in Baltimore to meet demand. In general, the popularity of Ouija boards in the United States has risen in bad times and fallen when things improved. Sales increased during World War I as those who believed in the board’s powers sought a way to keep in touch with relatives fighting overseas. The board’s popularity waned during the ‘20s and rose again during World War II with thousands being sold in department stores. After a period of faltering interest during the ’50s, sales again rose during the ‘60s as America’s interest in spirituality increased. Ouija boards outsold Monopoly in 1967, a year after the Flud family sold the product rights to the Parker Brothers company. Several peculiar incidents over the years helped Ouija boards earn a reputation as mysterious, occult devices, more sinister than the parlor game they were marketed as. In 1913, Pearl Curran claimed a novel she wrote was dictated to her on a Ouija board by the spirit of an English woman, Patience Worth, who had reportedly been killed by an Indian after immigrating to America. This dictation through the Ouija board went on for 20 years, ultimately resulting in the novel titled “The Sorry Tale” along with a number of other writings. In 1933, Ernest J. Turley was shot in the back by his daughter Mattie on the urging of her mother Dorothea Irene Turley. Mrs. Turley was cheating on her husband with another man and convinced Mattie that Mr. Turley needed to die based on what her Ouija board had told her. Mattie ended up doing six years in an Arizona prison while her mother served only three. In 1956 Helen Peck left her entire $180,000 estate to John Gale Forbes, a man whose name was spelled out on her Ouija board in 1919. Forbes was never found and a judge eventually voided the will and awarded the estate to her relieved heirs. Psychologists believe Ouija boards work through the conscious or unconscious efforts of those who have their fingers placed on the disk. As questions are asked the participants move the disk around the board to spell out the answers they want. In spite of this scientific explanation there are those who believe Ouija boards are genuine and dangerous occult devices which should be avoided at all costs.